Box Text: 4-PLAY AT ITS BEST! 1 to 4-Player Cooperative Action: Alone or with up to 3 of your friends, embark on a quest to collect the mythic 13 rune stones and battle the evil wizard Garm. 60 Dangerous levels: Hack and slash your way through the Forsaken Province, Warrior King's Mountain Realm, Dwarves Ice Caves and many more. 30 Awesome Powerups: Wield the Electric Amulet, Super Shot, Acid Breath, Fire Shield, Thunder Hammer, X-Ray Glasses and much more! Nintendo Gamecube Exclusive Features: Expanded inventory system, stereo sound, higher resolution graphics, and brand-new power-ups available only on the Nintendo GameCube, make this the BEST GAUNTLET DARK LEGACY EVER! 07-14-2017 sumiosquirrel Box Text 4-PLAY AT ITS BEST! 1 to 4-Player Cooperative Action: Alone or with up to 3 of your friends, embark on a quest to collect the mythic 13 rune stones and battle the evil wizard Garm. 60 Dangerous levels: Hack and slash your way through the Forsaken Province, Warrior King's Mountain Realm, Dwarves Ice Caves and many more. 30 Awesome Powerups: Wield the Electric Amulet, Super Shot, Acid Breath, Fire Shield, Thunder Hammer, X-Ray Glasses and much more! 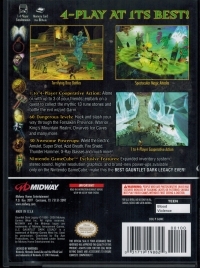 Nintendo Gamecube Exclusive Features: Expanded inventory system, stereo sound, higher resolution graphics, and brand-new power-ups available only on the Nintendo GameCube, make this the BEST GAUNTLET DARK LEGACY EVER! 01-20-2016 aliensstudios Box Text 4-PLAYER AT IT'S BEST 1 to 4-Player Cooperative Action: Alone or with up to 3 of your friends, embark on a quest to collect the mythic 13 rune stones and battle the evil wizard Garm. 60 Dangerous levels: Hack and slash your way through the Forsaken Province, Warrior King's Mountain Realm, Dwarves Ice Caves and many more. 30 Awesome Powerups: Wield the Electric Amulet, Super Shot, Acid Breath, Fire Shield, Thunder Hammer, X-Ray Glasses and much more! 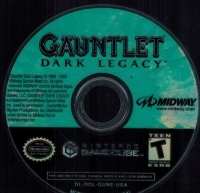 Nintendo Gamecube Exclusive Features: Expanded inventory system, stereo sound, higher resolution graphics, and brand-new power-ups available only on the Nintendo GameCube, make this the BEST GAUNTLET DARK LEGACY EVER! 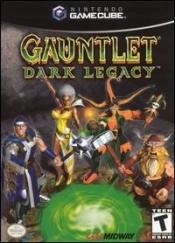 This is a list of VGCollect users who have Gauntlet: Dark Legacy in their Collection. This is a list of VGCollect users who have Gauntlet: Dark Legacy in their Sell List. This is a list of VGCollect users who have Gauntlet: Dark Legacy in their Wish List.